Deconstruction of a dramatic narrative can be a wonderful artistic device. Taking the elements of a story and presenting them in a different way can lead to new and exciting ways to see that story. Contra-Tiempo’s 2016 work Agua Furiosa does not do that. This 90-minute work by founding director Ana Maria Alvarez was presented as part of the Kravis Center’s PEAK series. It bounces from one poorly developed idea to the next, while sandwiching in equally underdeveloped mish-mashes from Shakespeare’s The Tempest. If that sounds confusing, well, that’s because it is. The ensemble rips through the highly eclectic movement phrases, sharp, detailed and specific only to have the choreographic bottom drop out and send them off to rearrange some mop buckets. The saving grace of the work, if there is one, is the stunning Pyeng Threadgill, who weaves her way through the entire work as narrator, vocalist and general overseeing goddess. Her spoken word and sung vocal delivery are world class. Agua Furiosa can never seem to make up its mind as to what it is about. Water? Human suffering? Shakespeare? Violence? The environment? All these topics are addressed in the most obvious and half-baked manner imaginable. What could have been a profound statement concerning all the above topics comes off as preachy, sophomoric and very long-winded. What the performers are given to do simply doesn’t actually add up to anything. While the world certainly needs more art and dances with messages and meaning, we also need to be able to understand them. Minneapolis-based choreographer Stuart Pimsler has been creating unique dance-theater works for nearly 40 years, and it shows. In an age when many movement-based artists are struggling for relevance and authenticity, he presents masterfully crafted works of the most personal and humane kind. 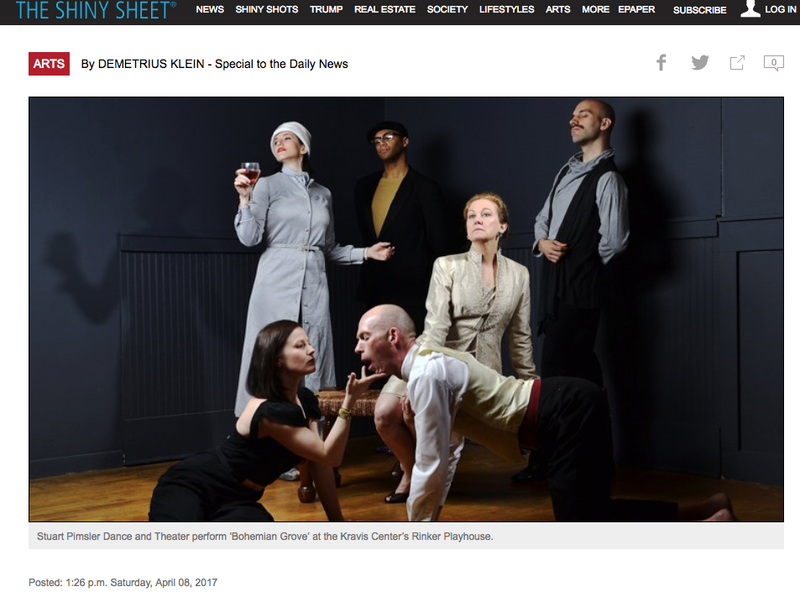 His company, Stuart Pimsler Dance and Theater, presented three such works Friday at the Kravis Center’s Rinker Playhouse. Tales from the Book of Longing, At It Again and Bohemian Grove made for a divinely curious evening. The Book of Longing, which premiered in 2009, is a rich essay on, well, longing. The piece begins with a dancer singing on a perch high above the audience in the theater’s catwalk. The dance develops into duets and ensemble vignettes of sometimes witty, sometimes wrenching, details all centered around wanting love, but never actually quite touching it. When we do finally see love achieved, it is in the form of a beautifully tender and supportive male duet, accompanied by the same singer singing plaintively on the stage at the dancers’ feet. This work asks the tender questions about why we want what it is that we want. At It Again is a tour de force dance monologue in which Pimsler himself dances and reads aloud a personal letter written to author Phillip Roth. While not intended to be knee-slappingly funny, Pimsler’s physical and vocal delivery takes the work to a special place of high political and cultural commentary mixed with a generous side of belly-laughs. Deftly executed and intellectually spot-on, this solo practically sums up and defines an entire sub-genre of post-modern dance in 10 minutes. Bohemian Grove derives its title and premise from a campground in Northern California used by the uber-rich and famous. Never one to shy away from the political, Pimsler lets the 1 percent have it with both barrels. The primary narrator is co-artistic director Suzanne Costello, who slithers through the piece with delightfully reptilian splendor. The rather cryptic and morose stories deal with the upper class’s desire and delight in keeping all others in their place by any means necessary. This visually stunning and emotional dance was performed by Costello, Brian Evans, Katherine Griffis, Jesse Neumann-Peterson and Scott Stafford. Each of the performers was rich and mature in their roles, bringing even more depth to an evening of masterful work. Stuart Pimsler Dance & Theater goes on stage at 7:30 tonight in the Kravis Center’s Rinker Playhouse.